Quiet bright fully self contained raised ground floor studio flat situated at the back of this building looking on to a mews. The flat has just been redecorated and benefits from new lighting & furniture and is just 3 minutes walk from Gloucester Road, or Earls Court Road. 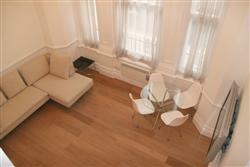 The flat has just been redecorated and benefits from new wooden flooring throughout. The flat comprises studio room, separate fully fitted kitchen with washing machine and integral dryer and bathroom with bath and shower. The apartment is situated on the raised ground floor at the rear of the building and looks onto an extremely quiet cobbled mews. Harrington Gardens is ideally located just 3 minutes walk from all the amenities that Gloucester Road and Earls Court Road have to offer such as public transport, restaurants, supermarkets and all the other shops. TOTAL SIZE: 302 SQ FT. The property comprises; Extremely large studio room with wooden flooring and walnut furniture, fitted storage in hall between kitchen and studio, fully fitted kitchen with corian worktops & washing machine, and shower room with plenty of storage with tiled shelves and great views over South Kensington. Newly refurbished contemporary one bedroom flat with solid wood flooring throughout, on the top (4th) floor of this building located in a quiet and charming one way street in the heart of South Kensington moments away from all the attractions this area has to offer. Rent includes Council Tax!! The property has been completely redone throughout and comprises entrance on 3rd floor with private staircase up to living room with fully fitted open plan kitchen and integrated washing machine, bedroom with spectacular views over South Kensington and contemporary en-suite shower room. This newly refurbished flat is situated on the raised ground floor. The flat has solid oak flooring throughout and comprises living room with contemporary furniture, large plasma screen tv and fitted storage, stunning kitchen with Macassar ebony units, granite worktop, integrated washer/dryer, integrated fridge/freezer and fitted wall base and wall units. The shower room has floor to ceiling marble tiles with large wet room style shower. Harrington Gardens is conveniently just off Gloucester Road and is also 2 minutes walk to Earls Court Road. Newly renovated one bedroom flat done to a high spec, situated just off Old Brompton Road in a quiet side street, the rent includes Council Tax! This one bedroom flat has been completely renovated and benefits from solid oak flooring and central heating throughout. The flat comprises hallway with fitted storage, living room with open plan kitchen with integrated washing machine with dryer and secondary glazing, large shower room and bedroom with fitted storage. The shops, restaurants, supermarkets, public transport and other attractions of South Kensington are just moments away from this centrally located apartment.